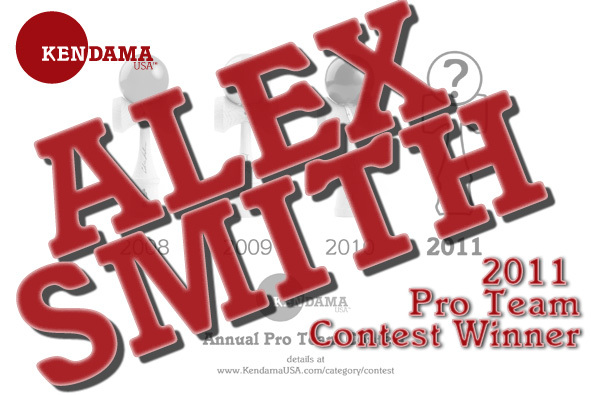 We are proud to announce Alex Smith as the winner of our annual contest, and the newest addition to the Kendama USA Pro Team. Alex’s edits clearly showed a wide variety of talent and professionalism. Amazing tricks, technical ability, creativity, lifestyle, personality, and production value. He has already made a positive mark in the Kendama community, and we couldn’t be happier to have him as part of the family here. If you haven’t seen them already, make sure to check out his edits below. We also want to tip our hats to everybody who entered this year, and especially those who came very close in the 2nd round. The quality of the entries absolutely blew our minds, and we have immense respect toward everybody who participated. It was by far the most difficult contest we’ve ever had to judge, so hold your heads up and give yourselves the well deserved credit for what you accomplished. We hope you had a fun time making the edits, and can’t wait for next year. i thought it was the U.S.A team? I thought it was the USA team? It is, but they let people from around the world compete! And I agree with this decision! Even though there were a whole lot of good people that would fit the spot, he fits it the best. Creativity, style, and just straight up steeze! He’s one of my favorite players! Good job Alex!! You sure deserve it!!!!!!! Happy for Alex but was so hoping for Dave Mateo. It’s not the U.S.A. team. It’s the kendamaUSA team. So it’s not for this country it’s for the business itself. Because it’s for the business they allowed anyone anywhere to enter. congrats to Alex. I was really hoping for Dave Mateo to make it.. I didn’t know what real steeze was until I saw him play. What color will the new Pro Model be? Gus Cartens should of won this is BULL CRAP!! 2011 is when the going does he get out? i agree that keith should have one but alex is good to, you guys should hook up with WKT (keiths kendama group) they are amazing this video is great!!! Hey good job, I was hoping you would win! I’ve read some just right stuff here. Certainly price bookmarking for revisiting. I wonder how a lot effort you place to create this sort of excellent informative web site. When are the pro models coming up for sale again, i would like to buy more. Just a guess but I think that they will release Alex Smith’s pro model kendama sometime during the summer when they restock all of the other pro models. Guys stop arguing we all know Alex is good but Dave Mateo is awesome he should be on the pro team !!!!!!!!!!!!!!!!!!!! Does the paint on the tributes chip easily? Good quality paint. Comparable to TK16 / Ozora quality, but still any Kendama paint can chip over time. anyone know when they will release alex smiths pro model kendama? Nice job! Congrats! Love your style keep kenning!